If you want an extraordinary mountain home in Estes Park that is perfect for families and has tons of room (not to mention absolutely stunning views)... look no further. See our video at photo 49. OVERALL HOME: With over 6600sqft in living space, this log style two story home is one of the largest and nicest rental homes in all of Colorado. It is situated on over one acre natural lot with trees, rock outcroppings, and abundant wildlife. It is on a paved street and has a large paved circular driveway. Including the master suite, it features 8 bedrooms, 4 baths, 3 living/sitting areas, 2 fireplaces, outdoor fire pit, a game room, over 2400 sqft in decks, and yes… even a one-of-a-kind indoor basketball court!!! THE VIEWS: The house is situated right at the base of the continental divide and is surrounded by panoramic views of Twin Sister's (13,000'+), Long's Peak (14'000'+), and the continental divide itself. Most of the view is of Rocky Mountain National Park peaks. THE BEDDING SET-UP: Yes... eight bedrooms! Enough for everyone to have their own. And they are all very nice size...all larger than the average bedroom and all with larger than average closets. The bedrooms feature the following bedding set-ups all with themed décor that match native animals in the park including master(king), elk(king), bear(king), bear 1 (1 king), mountain lion(queen), trout(queen), moose(queen) and bunk room with two sets of bunk beds for a total of 18 beds. THE MAIN LIVING AREA: The huge professional kitchen features granite counters, maple wood cabinets, double oven, professional series separate refrigerator and freezer, desk area with wireless internet, and a unique outdoor kitchen (10’ by 10’ upper deck with built-in 8ft stainless steel grill – just outside the main kitchen through glass French doors). The main living room features lots of open space with comfortable furniture, a billiards area, a nostalgic winter sports décor, and a large screen HDTV, 2 gas fireplaces/200+ DVD library all built into a dramatic slate wall. SPECIAL FEATURES: The over 2400 sqft+ in decks (three upper and two lower connected with a wood bridge) feature an 8 person hot tub, fire pit, outdoor furniture, and 2 picnic tables. Also outside is a very nice horseshoe court, and a 1800's rustic trail wagon and corn hole game. Other features include a 2.5 story atrium with bear water fountain, a 2nd living room with fireplace, 4 bathrooms, and a two car garage. INCREDIBLE MASTER SUITE: 1000sqft master suite is It features the master bedroom (with king bed, built in TV, desk, sitting area, and 2.5 story ceiling), a deluxe wet bar (with granite counter, double sink, small fridge, and maple cabinets), an amazing master bathroom (with huge garden tub and large extended tiled area with 4 shower heads), and a private deck. THE WILDLIFE: And despite the excellent all around qualities of the home, the best feature may just be the wildlife. Sited on the property have been coyotes, foxes, marmots, badgers, ground squirrels, black bears, and literally hundreds of birds and mule deer. And of course too numerous to mention... the herds of elk. As a matter of fact, over 50 elk were counted on the property at one time (actually multiple times!). Events: Please be aware that we have lots of 50th wedding anniversaries, retirement and other celebrations. We also have many families celebrating weddings stay at our home. Please be aware that we are not allowed to have weddings or other events where others are invited to the home. We will allow a family to have relatives come for dinner but that must be requested when booking. The Town of Estes Park currently regulates parking so we are only allowed to have 4 cars in the driveway and 2 in the garage for a total of 6 cars. There is no parking allowed on the street or in landscaped areas. We love, need and respect our guests, and we want you to be happy and comfortable that you have chosen the right rental for your stay. -mature adults or multi generations attending weddings, local events or celebrating significant life moments. Please NO EVENTS at this property! This house is for your group only. -No rehearsal dinners, oyster roasts or wedding breakfasts where people are invited that are not registered to stay in the home. Please support our local businesses, venues and restaurants for your event needs. Please feel free to call or email with any questions. We will do our best to accommodate you. We are a family of 5 and we love to be active and surrounded by nature. Wether it be the mountains, ocean or the desert, we enjoy visiting new places and meeting new people. We visited Estes Park in 2011 and decided we eventually wanted to live here. An opportunity arose for us to purchase a home. We decided we had to have a piece of paradise for ourselves. Simply one of the best locations in one of the most beautiful mountain towns in the country. The home is located between the downtown of Estes Park and the main entrance to Rocky Mountain National Park. The setting is natural and park-like itself with abundant wildlife passing through year round. Even with limitless outdoor activities in the area, there are also extensive activities in the house including: billiards, basket ball court, air hockey, 8 person hot tub, and over 2000 sqft in decks with views that are just plain stunning! 1.6 miles from the main entrance(Beaver Meadows) to Rocky Mountain National Park. Estes Park is the basecamp for Rock Mountain National Park. Eldora is the closest ski resort. It is about an hour drive. We have a landline phone located on main floor. Separate game room with foosball, air hockey and basketball court. Pool table is upstairs in the main room. a collection of over 200 dvd's including some movies/shows featuring Estes Park, The Stanley and the surrounding area. Outside area is rocked around decks and has horseshoe pit. The rest of the yard is left natural for the elk and other animals. 8 person hot tub located on bottom level of deck with panoramic view of mountains. The Park Entrance Lodge is a fabulous place to stay for 18 people. It is extremely well outfitted, is very clean and spacious, and has spectacular views. The beds are very comfortable and the decor thoughtfully done. There is plenty of entertainment available, from several TVs, DVRs, huge hot tub, basketball hoop inside, air hockey, and shuffleboard with the small round pucks that you push with your hands. The three decks are stunning, although we couldn't spend much time out there as the weather was still very cold. We thoroughly enjoyed our stay and would go back the next time we are in Estes Park. This place was spectacular. A group of 18 friends were easily accomodated and had plenty of room to sleep at night. The hot tub was delightful, the basketball court was awesome, and the views of the mountains were unbeatable. There’s tons of deck space with a big grill to cook on. The main living area was where time was mostly spent. The pool table was a big hit. 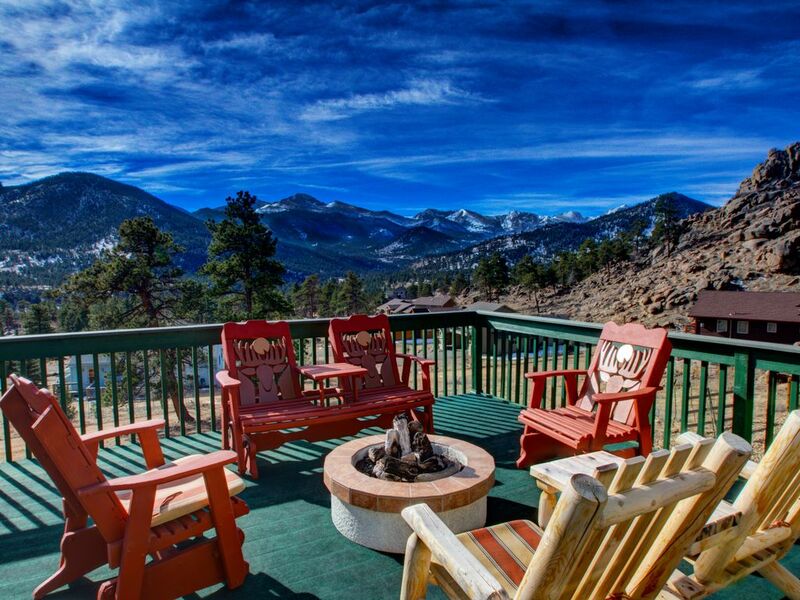 This place is a must-stay if you’re staying in Estes with a big group. Thanks Julie- your communication was thorough and timely! What a trip! Had a family get together at this house, there was more than enough room for all of us to enjoy everything it had to offer! The place had everything we needed. And you cannot beat those views! Really enjoyed our stay, it opened our eyes to a new and stunning part of Colorado. Will be back! My friends and I rented this amazing place in late Feb of 2019. We had a great time playing basketball, sitting in the hot tub, and just hanging out. The house is in great working order, everything was very clean, organized, and just plain useful. Julie was very helpful in providing information on things to do, places to eat, and how to do certain things within the house. I highly recommend this house, especially for families and groups of people like to play games. We can not give high ratings to this home. There was plenty of room for everyone to have their own space, but still be together. Kid and adult friendly, close to town, good amount of parking, all the necessities were provided, the list goes on. We fully intend to return! We are so happy you enjoyed our home! We would love to have you back! Damage Deposit: We require a separate refundable damage deposit which is due 2 weeks prior to rental and returned after rental. We do not include this in the damage protection section because the website payment section is set up to collect it much earlier than the rental. Payments: Required payments may differ than those listed on the VRBO quote. We often book up to 2 years in advance and we like to be able to change payment terms for these rentals because they are so far in advance. Please send an inquiry instead of a Request to book so that we may make these adjustments. If you use Request to Book or Book it Now we are unable to make some of those changes. We prefer payment via echeck through VRBO or paper check. If you would like to use credit card we charge a 3% fee which is what we are charged.